A long time ago I celebrated my eighth birthday. I remember nothing about it. My only real certainty about whether or not I even had an eighth birthday lies in the simple chronological truth that one cannot arrive at forty-six without having, at one time, been eight. What happened the day I turned eight? I have no clue. Did I get presents? Most likely I did. What might they have been? I have no idea. 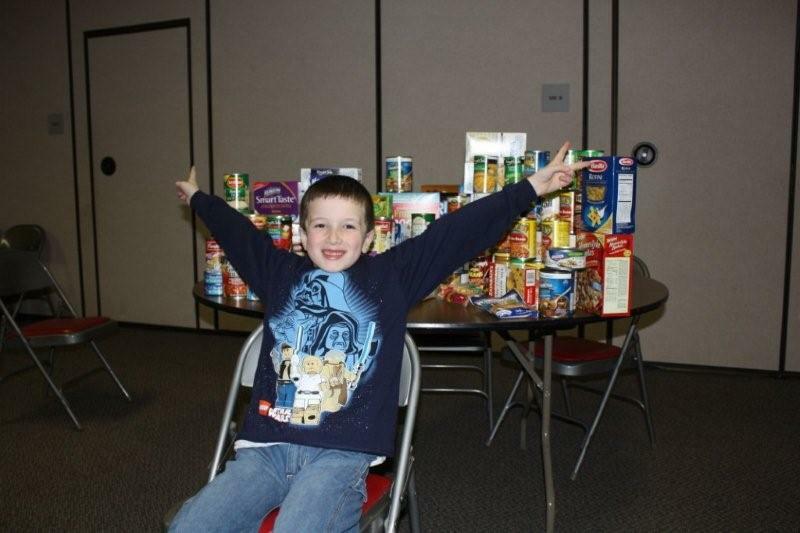 What I am fairly certain that did not happen on the occasion of my eighth birthday was that those celebrating with me were asked to bring canned food and non-perishables to help replenish our church’s food pantry. In fact, I am pretty sure that the church that my family attended during that time did not have a food pantry. So this week a mother of a boy who just turned eight sticks her head into my study and requests my presence in the fellowship hall. In the fellowship hall, there is a round table loaded with canned goods and non-perishable food items. The children who celebrated Breton Stanley’s eighth birthday brought these items to his birthday party in lieu of gifts. As I looked at the food on the table and realized how it came to be collected, I was both impressed and grateful. I was impressed that Breton’s friends had contributed so much food, and grateful that it would be available to hungry families who come to our church seeking help. When I heard Breton talk about the food that had been collected, and heard in his young voice a sense of understanding about what the food would mean to those families in need, I realized that the food collected was more than just an idea that Mom and Dad had suggested. He understood that thinking of others and acting on their behalf was a way to give expression to what he had learned of Jesus and His teachings. In talking to his mother, I learned that Breton was not alone in putting his faith into action. Other children had done likewise at their birthday parties. Hayley Lovingood had collected items for Family Promise, and Leo Jaramillo had collected food for Second Harvest at their parties. Who knows what others have done? What children! What parents! It is of little consequence, all these years later, that I cannot recall a long-ago birthday present. Yet, what might it mean years and years from now that these children have been shown how to give mercy and to show kindness? What might it mean that they understand that to have regard for the least of these is to have regard for Christ? What might it mean that they have learned early to put hands and feet to their faith? How many lives will they touch as they show compassion to those in need and invite others to join them in living for Christ? This is happening right before our eyes. The Bible is being taught and learned. Step by step, and day by day, boys and girls are living lives shaped by the teachings of Jesus. It is cause for great hope. It is more than that; it is also a testimony to the reality of God at work in our church. Every day there are events taking place in our city and in our world that cause us to question, to have doubts, and perhaps even to feel fear. When we see our children putting their faith into practice in such a meaningful way, it should be a significant reminder that we are not alone. With their faithful acts of kindness, they are not only reminding us that the light of Christ is still shining, but they are also becoming part of the reason that darkness cannot overcome it. This entry was posted in Spiritual Formation and tagged Birthday, children, Families, Giving, Hunger, Poor, Spiritual Formation by edsundaywinters. Bookmark the permalink.